Running for 12 hours…sounds fun right? I am not sure when I decided that running for 12 hours sounded like fun, but somewhere along the way I must have. Either that or my dog accidentally registered me for a 12 hour endurance trail run. Im leaning towards the dog having a good laugh at my expense. Fast forward and BOOM it was race week. After the disastrous Two Way Torture Test, which is a 13.1 + 13.1 that goes relentlessly uphill on pavement, that Patrick and I ran just a week earlier, I did not have high hopes for the 12 hour Alaska Endurance Trail Run. I did not even bother to set a goal, other than to keep moving for more than 8 hours out of the 12. My sister Susan said I should go for at least 40 miles, I just kinda laughed at her. She is my task master always pushing me to be better, she is everything I wish that I was 🙂 The Alaska Endurance Trail Run (AETR) is a 6 mile loop through rolling hills of our nordic ski trail at the University of Alaska. From wide trails to very rooty single track with a few down trees as obstacles. I run on this section of trail at least 2x per week as it is just a few steps from my office at the Uni. Friday afternoon I hook up with Don, the race director, and we head to Sam’s Club to buy feed station food and post race BBQ foods. I am not sure either of us were prepared for the Sam’s club onslaut…first of the month on a friday afternoon, it was cray in there! But we got just about everything on his list and I trucked it all home to hold for after the race. Friday night, I got all of my things together. Lots of shoes, sock, and my measly food stores. I carbo’ed up with the meal of champions, Taco Bell. Yes, Taco Bell. Saturday morning came early at 5 am with the sun already shining. In the land of the midnight sun of Alaska, this time of year it always is! The weather was looking at mostly sunny around 65-70 degrees, with an isolated shower possible in the later afternoon. OK, this looks promising. I have my early morning Cafe’ Caramel protein shake and get ready to head out the door for a 7 am check in time. PreRace meeting, Travis snapped a photo! Pre-race briefing, with Don the race director and off we go! The first loop was GREAT, I felt amazing. Kept to my pace of about 11:30 per mile just to get my feet under me and to get a jump-start on the long day. I had my audio book all ready, the BBC Radio dramatized version of Hitchhiker’s Guide to the Galaxy. Normally this part of the trail is a mini lake! Somewhere around loop #2 I started to feel the beginnings of a hot spot on the inset of my foot near my big toe. So at the end of loop 2 I stopped and put some moleskin on that spot on both feet. This tends to be where I get tender and/or blister spots. I decided to keep on with my Hoka One One Speed Goat trail shoes for a little longer. After loop 3 I got a nice surprise, my running partner Patrick was waiting for me at the starting line 🙂 YAY!!! I got a huge lift of spirit when I saw him as I was running up to the line. Love this man to death, he is so awesome and always so supportive of me and the crazy schemes I come up with for us to do. He tweaked his back earlier in the week so he was unable to run or participate this year. We talked a little, and I got a bite of my Quest strawberry cheesecake protein bar and some poweraid zero. At this point I decided that I needed to run with my handheld as it was getting warmer. So I popped a NUUN tablet in with my water and off I went. I did this each lap, drank some poweraid zero, a few nibbles of the Quest Bar and then filled my handheld with NUNN water for the running part. Lap three was mentally HARD. I think I walked more this loop than I did any other loop. I got an amazing lift at the completion of lap 4 I had a gift left by my girlfriend Skye, who was walking the 12 hour or at least most of it. She had left to course for a little bit and brought me back a bun-less cheeseburger. It was the best damn patty I ever had. It was perfection! That gave me the energy to pick up the pace. I also took this time to take an extended break of about 15 minutes. Re-applied my moleskin, new socks and then I changed into my Brooks Adrenaline’s, these are a little on the big side and my feet had began to swell so they felt amazing. Lap 5 uneventful…more running. I tried to keep a strategy of running the first 2 miles, run/walk 3-4, and running the remainder. This seemed to work well. I felt really good the whole time so far. My motor was strong, my body felt good, other than my feet were getting really tired. Lap 6 was my last full lap. Ran through some brambles getting around the downed tree. The last 2 hours of the race a shorter course was opened up, which was roughly half a mile. This way you could maximize your mileage. Strategy is involved in that this small loop was muddier than the rest and much hillier than the big loop. I got in my 36 then decided to change shoes one more time to my old Hoka Clifton 1’s as they have the widest toe box. I drank one protein drink and decided to hit the small loops. I could have possibly made one more big one, but I did not want to chance it. Only full loops counted and I didn’t want to make it all that way to only not have it count. So off I go on the mini loops. Rachael taunting me to do MORE! I did run/walk a small loop with my work and running buddy Tom. He is awesome and was doing the 6 hour version. He is a running machine. I want to be like him when I grow up 🙂 At this point time was winding down and I had made sister Susan’s goal of 40 miles. I decided to give it one more baby loop just for good measure. At the end of my final loop Stacey and Rachael were trying so hard to get me to do just one more, even offering to run it with me……but I was DONE 🙂 Extra beer stamps on my beer card were not enough to get me to run more. I finished the day with 40.50 miles. I also ended up out of the 12 hours moving about 11:05 of the time…whoa a lot more on my feet than I thought I would do. Things I would do differently: Better nutrition. I am sure that I did not get enough calories, with 2 protein drinks and a single kid sized burger patty and a single Quest Bar. But that said, I was never hungry nor did I feel like I crashed. Better Hydration. I drank the whole race, but never once had to use the bathroom. I never felt thirsty, but I think I needed to add more electrolytes, maybe…. Tape/moleskin up right from the start my normal hot spots. At the start I had no idea that I could do this. But it was amazing fun. And the thing is I was not as tired as I thought I would be. I still had gas in the tank and legs to run at hour 11, I figured by that point I would have been reduced to crawling. I learned yesterday that my body is capable of much more than I give it credit for. Today I feel pretty darn good. I feel less tired today than I did after the Two Way Torture Test that Pat and I did the week before, its kinda amazing. My legs are good and surprisingly not a single blister to be found, now that in itself is a miracle. Onward and forward to the next Ultra! Oh Happy Day! Do the Happy Dance! I am very happy to announce that I have been chosen to represent the most awesome fitness clothing line in the USA. INKnBURN. How awesome is that? Being an INKnBURN Ambassador is a incredible experience and I am super grateful for the chance to promote a made in the USA brand. This brand embodies all of the things that I love. Mixing art, colour, and imagery on amazing quality made clothing that is comfortable and stylish. INKnBURN makes me feel amazing. I’ve tested it out on bike rides, ultras, running, and skiing and it has never let me down. I always get amazing feedback each time I wear one of these amazing pieces. For the first time I have wanted to represent a brand, normally a brand is a brand but in this case the amazing designs and the quality coupled with the amazing team who work hard in So.Cal designing all the way to producing each an every piece are amazing. 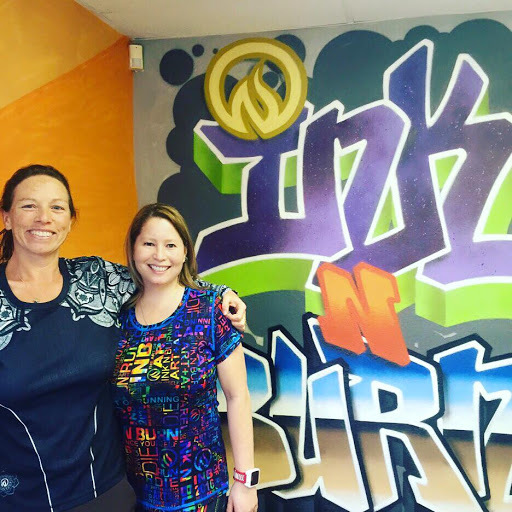 I had the pleasure of visiting the INKnBURN studio just a few weeks ago with my So.Cal friend. They were working hard to get out many new garments (PI Day, Lucky Charm, Club items) but we were still treated like royalty! We must have been there for 2 hours trying things on and talking about what we loved about the designs! And if they didn’t have our size or style on display she happily looked in the warehouse to see if they had it in stock. It was amazing experience! I got to see up close all of the amazing current designs and they are all so much more amazing in person! 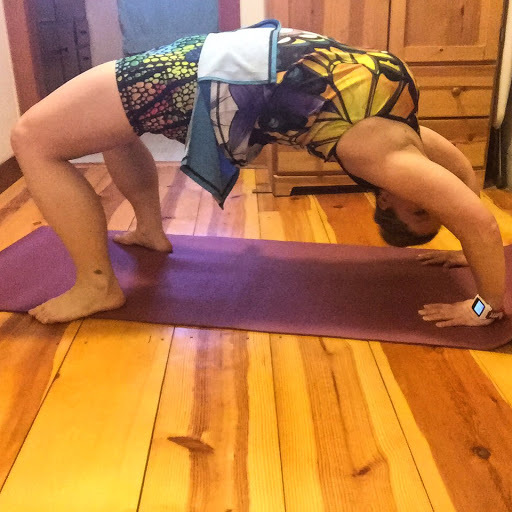 Colour is a big part of my life and how can you look at this amazing INKnBURN Miko tights and arm warmers and not feel uplifted and strong? I can feel the uplifting vibes from this “retired design” tank called Flutter combined with the current Chameleon Sports Skirt? I can feel the fluttery wings of a butterfly lifting me up! I challenge each and everyone of my athlete friends to try at least one piece. With so many amazing and different designs there is always a new design to choose from and one that may just be that special piece that “speaks and whispers” to you from afar! One piece and you will be hooked. I promise 🙂 So now head over to http://www.inknburn.com and getting shopping!